Fall always seems to be when the best digital storytelling projects get started. Students are settled in, the air is crisp, and of course, there’s Halloween! At their best, digital storytelling projects can provide transformative experiences. 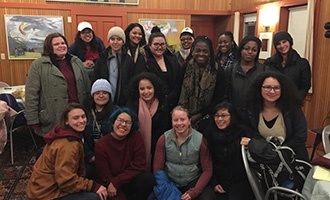 Read how Smith College’s “First-Gen Out Loud” program is using digital storytelling to help students gain fresh perspective on themselves and their place in the world. Then we look at powerful new features such as iOS motion titles (including our special Halloween themes), color correction tools, and improved workflow for trimming clips. Read on for all that plus news, events and a very special Halloween promotion for individual educator licenses. Trailblazing isn't easy. That’s why Smith College puts a special effort into helping “first-gen” students, the first in their families to attend four-year college, overcome unique challenges. The school’s Wurtele Center for Work and Life, headed by Director Jessica Bacal, hit upon a winning formula, using digital storytelling as the backbone of a year-long program. Along the way, they developed a supportive community of peers, helped students recognize and value meaningful experiences, and guided students to get better at talking about themselves, coaching each other, and building new relationships. Educators and students reveal the details of the pilot program with an eye firmly set on the future. Motion titles are a powerful addition to any digital storytelling project. One of the most popular features in our web app, students and teachers will discover a whole new level of flexibility with new motion titles for your iOS devices. 36 professionally-designed templates make it easy for anyone to get started. Just add template to a clip in a storyboard and type your text. That’s it! If you want to make a look all your own, you can customize many aspects of a template including timing, position, layout, colors, fonts, and font size. Halloween is the inspiration for great school memories and fun projects. 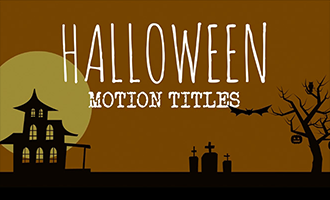 Just in time, WeVideo has added its first-ever seasonal special theme pack of motion titles and graphics. You’ll find templates filled with flying bats, haunting ghosts, creepy spiders and all the other looks that scream Halloween fun! This theme pack is available right now for education accounts via the WeVideo web app and iOS devices. Read more and check out our Halloween video for a scary taste. 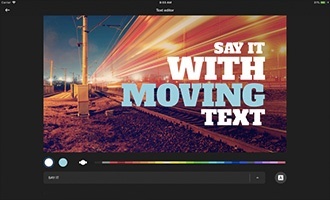 Two significant features have made their way to the WeVideo app. 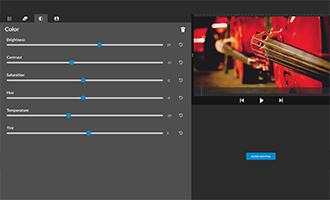 You have always been able to enhance the appearance of video assets using handy pre-made themes. Now new color correction tools help you get the exact look you are after. See the results in real-time using precise sliders that let you adjust brightness, tint, contrast, saturation, hue, and temperature. Our other new feature makes trimming clips easier than ever. Now instead of first dragging clips to your busy timeline, pre-trim lets you find the sweet spot right in the media bin. It’s easier and faster. Special Halloween Offer: Through Oct. 31st, we have a SPOOKTACULAR 31% discount on any new individual web subscription (sorry, no WeVideo for Schools plans this time around). Click for details. GEG Student Film Festival: WeVideo is proud to again be sponsoring the incredible GEG Chicagoland Student Film Festival. Don't delay, deadline for submissions is December 15th. Upcoming Events: As always, visit our Events page to find out where you can meet the WeVideo team.